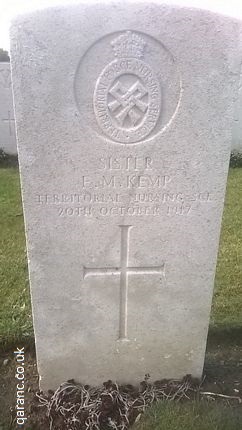 Sister Elise Margaret Kemp of the Territorial Forces Nursing Service was killed during a German airplane bombing raid whilst nursing with the 37th Casualty Clearing Station at Godewaersvelde, Flanders (on attachment from 58th CCS) on the evening of 20/10/1917. Three patients and three RAMC orderlies were also killed. Other patients and staff were injured. She is thought to have been the only New Zealand nurse killed in the Western Front during action in the First World War. She is buried at the Commonwealth War Graves Commission Godewaersvelde British Cemetery. Elise was born on the 19th June 1881 in Wellington, New Zealand. Her parents were Dr William George Kemp (physician and surgeon and originally from Alnwick in Northumberland)) and Charlotte (nee Greenwood born in Motueka, Nelson Province). She had two other sisters and three brothers. Dr Kemp worked as Resident Surgeon at Nelson Hospital in the South Island where he met Charlotte. The family relocated to London where Elise was educated at the Church of England High School at The Shrubbery in Streatham High Road and then finishing schools in Brussels. In 1904 Elise trained to become a nurse at King's College Hospital (there is a memorial plaque to her in the Chapel). She graduated on 12 February 1908 and worked as a surgical nurse and then as ward sister in the male surgical wards. She joined the TFNS in 1914 where she worked in London. 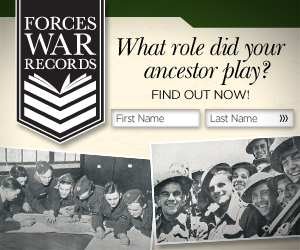 Two of her brothers, who were physicians, joined the Royal Army Medical Corps. Elise served on the Western Front from January 1916. More war graves of nurses. If you would like to contribute any information or photographs then please contact me.